What is the Trichoderma ? The Trichoderma are imperfect filamentous fungi belonging to the class Deuteromycetes. The perfect form belongs to the class Ascomycetes ( Hypocrea ). This genus includes about 20 species of fungi , cellulolytic. The Trichoderma produce woolly colonies to grow very fast and are white, yellow-green or sometimes green. The hyaline conidiophores, more or less compact according to condiophores, are septed, regularly and abundantly branched at right angles to the principal axis. The phialides, wholly ovoid to ellipsoidal, isolated or grouped in small numbers 2-3, are arranged on the branches, generally perpendicular to the axis. The unicellular, round or ellipsoidal conidia, smooth or verrucous, are produced in mucilaginous masses, forming glomeruli at the top of the phialides. The Trichoderma are cosmopolitan and ubiquitous fungus, saprophytic outdoor environment. They are the usual contaminants of crops but are poorly pathogenic and therefore develop few diseases. They are involved in type I and III allergies and a few cases of mycosis in immunocompromised individuals. Various species produce antifungal metabolites such as trichoriazines and many mycotoxins (trichothecenes and cyclic peptides, gliotoxin, isocyanides, T-2 toxin, trichodermine). The Trichoderma have food interest in the production of cellulase and hemicellulase and as aroma and taste enhancer. Some species of trichoderma are used in biological control for the protection of trees and vegetable crops against the attack of phytopathogenic agents and moreover very effective in the indoor or outdoor cultures. 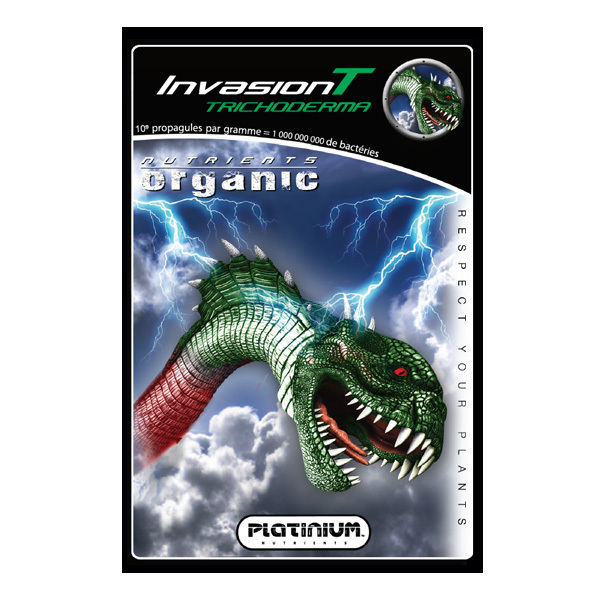 INVASION T of Platinium Nutrients is a concentrated inoculum consists of spores of Trichoderma atroviride MUCL45632, antagonistic fungus that colonizes quickly rhizosphere to improve plant growth and resistance against pathogenic organisms. 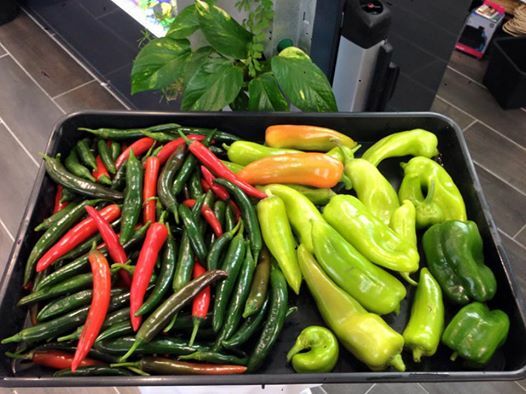 The selected strain gives the product high efficiency and good persistence in the environment. INVASION T is a natural product that provides a better vegetative growth , healthy plants for higher yields and better quality productions. Stimulation of vitality is to improve the ability of a plant to ensure its growth , its development and its entire life cycle in a given environment édaphoclimatique, whatever the limiting conditions (bad stress conditions ...) whether that environment in indoor growing and outdoor. Understand that stimulating vitality consists of improving the response to stress, improving the capacity to exploit the environment and reducing inputs, which allows better nutrient uptake. Proven by French research institutions and our various laboratories around the world. Quality guaranteed by Platinum nutrients innovative laboratories of tomorrow who have invested all their know how in the development and production of that invasion T Trichoderma high performance! INVASION T participates in the solubilization of minerals such as nitrogen, phosphate, manganese, iron, copper and zinc. 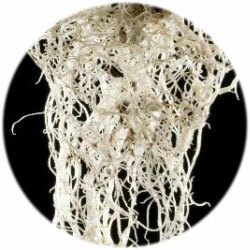 The root system develops up to 500% due to trichodermas these beneficial fungi in our hydroponics , by land or coconut fiber , ideal also for growing in closet or grow room . Get more root mass and more ramifications. Get better ability to absorb water and nutrients from plants is enhanced through trichodermas. The use of fertilization is optimized. INVASION T of platinum nutrients prevents the appearance of root necrosis. This useful fungus, by its multiple mode of action, allows your cultures to develop in an optimal and homogeneous way by increasing their tolerance to stress. Allie stimulation and very good protection of your crops and precious plants. the Trichoderma part in the solubilization of minerals such as nitrogen , phosphate, manganese, iron, copper and zinc. The capacity of water absorption and plant nutrition is improved; The use of fertilization is optimized. Rapidly forms a physical barrier around the space-limiting roots and fertilizers available for pathogens in the rhizosphere. With which it comes into contact. It can then exploit the contents of the pathogenic fungus. Your culture is a valuable capital that must be preserved from environmental hazards. Through its multiple modes of action, and the T invasion Trichoderma is the product you need to optimize your intensive crops under lights such as you grow in a small space your goal is to increase your results on your crops so Significant. The Trichoderma favors a root system healthy, well developed. And thus perform better in growth and flowering. The result is a high-quality, more robust, homogeneous and stress-resistant culture in a variety of forms. To incorporate your culture substrate or spread on the area being treated in culture on earth, hydroponics or coconut fiber and horticultural rock wool slabs, boost your crops with beneficial fungi Trichoderma, INVASION T at the best market price and easy to use with 1,000,000 bacteria / Kg . Stimulates and protects the roots of your crops. For your crops, the most important is what you can not see. With your practices of cultures in different forms. Compatible with most fungicides, insecticides and fertilizers used separately. Development on the root system of most plants. Temperature window: 10 to 34 ° C - pH window: 4 to 8.5. Offers best effects when applied early in the crop cycle, ideally at the seedling / sowing stage. This allows the Trichoderma quickly colonize plant roots in a substrate (soil) ( soils ) where few pathogens are present initially with a long-term action. Once installed, fungi protect your crops for 10 to 12 weeks for crops in the ground, and for 4 weeks for crops on soil-mineral support. During your cultivation, pathogens will settle in your crop supports or your soil. Reapply regularly is essential to maintain a sufficient population of Trichoderma harzanium around the roots so that the effects of remaining at their maximum level. Visit our radius bacteria beneficial Trichoderma , mycorrhizae in indoor growing, your growshop for your gardens and indoor cultivation, the best prices since 2002, try the beneficial fungi and optimize your indoor crops.